As public-school teachers, Joe and Marc both believe firmly in the value of accessible, public education and public listener-supported radio. The show is provided for free and without ads due to Joe and Marc’s volunteer roles as producers and hosts. They pay for hosting this site out of pocket to keep the show ad-free. If you would like to support the show, download, subscribe tell your friends. Also please support CJSW 90.9 FM in Calgary. As of 2019, Today in Canadian History has been listened to online over 2 million times. The show peaked at #1 in the iTunes Canada podcast charts. From day one the goal of our series has been to present Canadian history in an interesting and accessible manner. We work to excite and inspire Canadians to learn more about our unique and complex past. 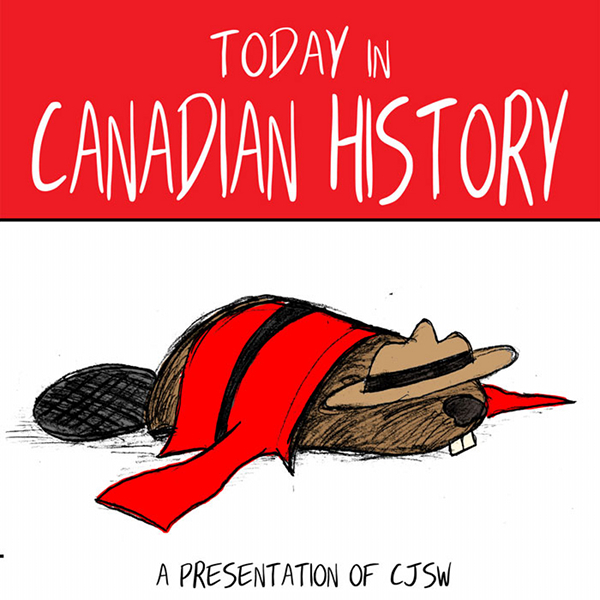 Each episode uses a specific event or date from Canada's past to launch a larger discussion on an issue, individual, or moment in Canadian history. To date we have produced over 220 individual episodes and have spoken with over 200 Canadian historians, journalists, authors, and "everyday" historians. We have collaborated with contributors from all corners of Canada and are regularly contacted by listeners and supporters worldwide. Marc began volunteering at CJSW 90.9FM shortly after receiving a Bachelor of Arts from the University of Alberta, where he majored in Political Science and History. He was employed at CJSW from 2011-2014 as the station’s News Director where he helped the station's volunteers produce their own podcasts that focused on food, urban design, student news, sustainability and aboriginal issues. Marc is currently a primary teacher in Calgary. Joe has been a volunteer with CJSW 90.9 FM radio in Calgary for over 10 years. He complemented his radio experience with a Bachelor of Arts from the University of Calgary. Focusing his studies on Canadian history and political science, Joe completed his undergraduate degree at the University of Alberta with a major in history and a minor in political science. Not yet content to put down the books, Joe completed a post-graduate journalism program at Mount Royal University. He worked at CJSW from 2009-2014 as News Director then Program Director. Joe is currently a primary teacher in Calgary. After a manhunt that lasted over one month, the man known only as “The Mad Trapper” is killed in Canada’s North. Joe Burima speaks with Barbara Smith, author of The Mad Trapper: Unearthing a Mystery to learn more. Kenneth "The Gentleman Bandit" Leishman stole nearly $400 000 worth of Gold bullion from the Winnipeg International Airport on this date back in 1966. To learn more we spoke with historian Christian Cassidy of West End Dumplings & This Was Manitoba. The creation of the first all-Black Canadian battalion in WWI. British Trade Commissioner James Cross was released by members of the FLQ on this date back in 1970. We spoke with Professor William Tetley, a member of the Quebec Provincial Cabinet at the time of the crisis as well as author of "The October Crisis, 1970: An Insider's View". Roy MacGregor, author of Canoe Lake discusses the disappearance of the now-famous Canadian painter back in 1917. On July 23, 1914 a steamship filled with passengers from India, The Komagata Maru, was turned away from Canadian shores. We spoke with Dr. Hugh Johnston on the incident and its legacy. Back in 1858 in the Province of Canada, the Cartier/Macdonald ministry pull the "The Double Shuffle", avoiding a by-election and staying in power. We spoke with Major Gustave Biéler's daughter Jacqueline Bieler, on the anniversary of his 1944 arrest while aiding the French Resistance in WWII.